Lol! Who's loving the twist as much as I am???!!! Now that's one keyboard you never thought you'd associate with an iPad. 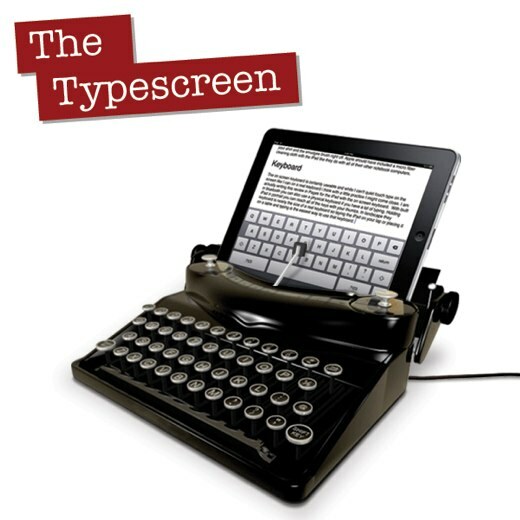 The Typescreen gives you the retro style of a typewriter fully compatible with the high-tech iPad and iPad 2. If you're wondering, it does type exactly the same way a typewriter does, only no papers needed this time, it will type directly on your iPad. I get the desire to stay true to the old form, but seriously, isn't it just easier to plug it through USB like a regular keyboard and keep the screen space for the "paper" ? I want to buy an ipad just to buy and use this typescreen! I would LOVE to have this!!!! How clever indeed! It is not real, I got very sad when i tired to order it and it was an april fools joke.